Guwahati: Sahitya Akademi Bhasa Samman awardee Tabu Taid has urged youths of various communities to study and preserve their mother tongues to safeguard the identities of their respective communities. Attending at a felicitation programme organised by All Guwahati Mising Kebang (AGMK) at Guwahati, the veteran scholar said that this award would encourage ten other people from the community to come up to do something for the society. “I thank you all for giving me this honour. I hope awards like this would encourage the other youths of the community to come up and do something which helps in developing the community,” said Taid who plays a major role in preserving the Mising language for which he was awarded the Bhasa Samman by Sahitya Akademi this year. He also urged the youths to understand the value of their mother tongue as far as the identity of their communities are concerned. “Everybody should realise the importance of their own mother tongues. Without the language they will have no identity. If a Mising youth cannot read Mising literature who else can? Therefore he or she has to try to preserve and spread the language,” he said. He also expressed serious concern at the rate at which languages are becoming extinct for lack of speakers in various parts of the world. As many as 36 local languages of Arunachal Pradesh, listed as endangered by the Unesco are facing the threat of extinction in absence of any attempt for their proper documentation which was revealed in 2010. Out of the 36 languages, some of them facing threat include Koro, Miji, Nath, Bugun, Meyor, Tangam and Puroik according to the Foundation for Endangered Languages and Central Institute of Indian Languages of Mysore. These languages are among the 196 languages listed as endangered throughout the world by Unesco. The member of Asam Sahitya Sabha executive committee is a prominent figure of the state with a number of literary works to his credit. He has authored a series of lessons and English textbooks for school students since the mid 1970s besides several key volumes about Mising language — Mising Bhaxar Banan Poddhoti (an orthography) and Mising Gompir Kumsung (a dictionary). He advocated translation for spreading literature of languages like Mising among the greater section of readers. “By preserving and spreading the language, Mising people will find an identity. Translation is one of the best ways for this. 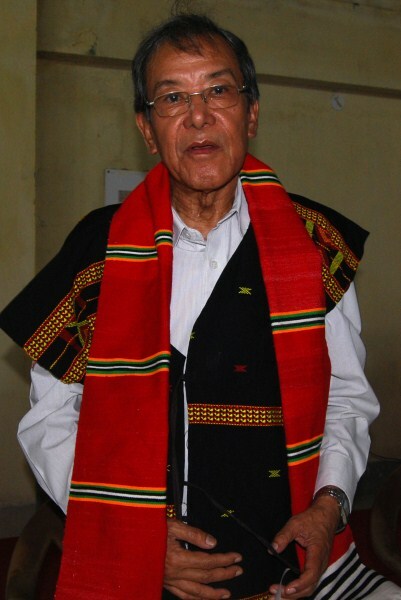 If our literature is translated into English, Hindi and Assamese we will have a wider section of readers,” Taid said after he was felicitated with a Mibu Galuk (Mising traditional outfit to respect the elders) and a Mising muffler. Taid, who started his career as a lecturer in the English department at Cotton College before going on to obtain a post graduate diploma in Applied Linguistics from the University of Reading and another course in distance education at Institute of Education University of London, however, rued that a section of people do not feel the need to preserve their local language. He is also member of executive council of Gauhati University and the chairman of the executive committee of Anandaram Borooah Institute of Language, Art and Culture. He was also the founder president of Mising Agom Kébang (Mising Sahitya Sabha). President of Takam Mising Porin Kebang (TMPK) or All Mising Students’ Union Johan Doley who was also present on the occasion said that works of Tabu Taid need to be highlighted.